James Comey at NPR's New York bureau. 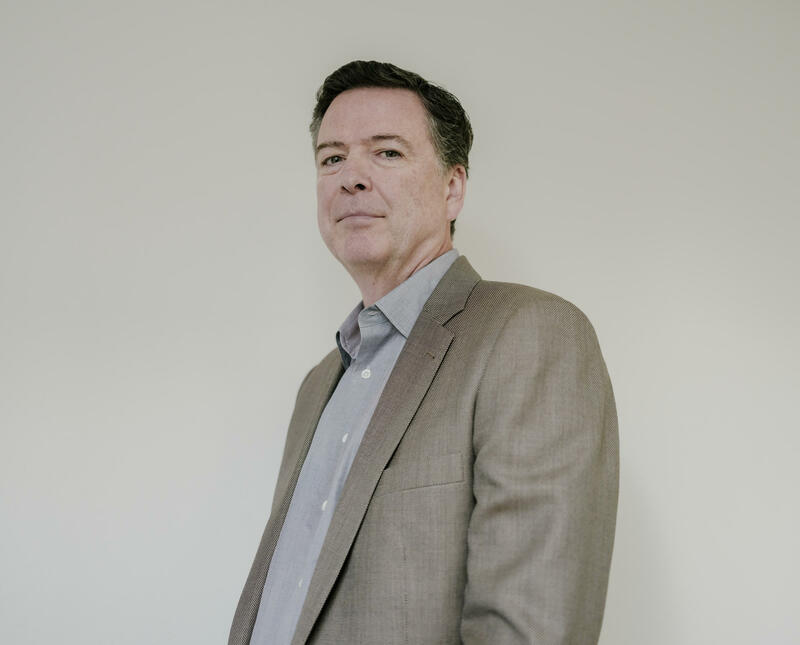 Nearly a year after President Trump fired James Comey, the former FBI director is out with a new memoir, A Higher Loyalty: Truth, Lies, And Leadership. Morning Edition host Steve Inskeep and NPR Justice Correspondent Carrie Johnson talked to Comey about his book, his role in shaping the outcome of the 2016 election and where the FBI's credibility stands. Here's the full transcript of their conversation. Steve Inskeep: You recount a number of instances in your career where it could be said that you were effectively paying lip service to what your bosses wanted while subtly trying to do something else. Is that the essence of the job in law enforcement as you see it right now? You have to give me particulars, since I don't see the pattern that you see. Inskeep: You don't see — well let's talk about the pattern. 2004, very famous case — John Ashcroft was the attorney general, you're the deputy attorney general, and you have an effort by the White House to get Ashcroft to sign a surveillance order and your role was effectively to prevent that from happening. You were doing something other than what the White House would have wanted. We could discuss — and we are going to discuss — when you were serving under the attorney general of President Obama, Loretta Lynch. So that's why I asked that question, is that a big part of the job as you see it? The reason I'm confused I don't get your reference to lip service. In 2004 it was about leading the Justice Department when it was saying that we couldn't certify to the legality of particular surveillance activities, and then defending that judgment. Inskeep: You disagree with the way I phrased it, but have I gotten something there? Part of your job as a senior law enforcement official is not always to do what you're asked to do. I think that's right. I think that's fair and it's to represent the values of the institution that you work in and that you lead. Inskeep: Well, let's talk about that incident in 2004, since it is well-known. An incident in which there was pressure for a surveillance order to be signed, and you were among those that didn't want it to be signed. Who were you standing up for, or what were you standing up for in that instance? Standing up most immediately for the Justice Department, and in a broader sense for the rule of law. The Justice Department's role there was to say what the law was and what it could reasonably support with respect to the surveillance activities, and some very smart lawyers in the Justice Department had taken a look at this activity and concluded they couldn't advance reasonable legal bases for a big part of it. And so my job was to represent that view, the department and the law. Inskeep: So you're thinking about the law but also thinking about the institution, protecting the institution that you work for. Correct. Correct. And in that instance it's the Justice Department and so the rule of law and the Justice Department are inextricably bound up. Inskeep: You were praised a lot when that incident came to light years ago for taking the stand that you did. Do you feel you did as well in sticking up for the law and for your institution when it came to the Hillary Clinton email case and the Trump and Russia case? I think so. I think those were more no-win situations. In a way that the 2004 was to my mind — and to the mind of the other lawyers at Justice — pretty clear-cut; simply couldn't find a legal basis to advance, and so it was a much easier question. In the email investigation, in particular, there was never a circumstance where there was a clear good option, there were just bad options and you were choosing between them. So in a way 2004 was easier. Inskeep: Was easier than these cases? You find these to be more complicated. Carrie Johnson: You talk about getting hatred or vitriol from all sides now of the political spectrum, and trying to tune out a lot of those people. But there are people whom you respect who have leveled criticism. People like Jamie Gorelick, a Democrat Justice Department veteran, Larry Thompson, Republican Justice Department veteran, who after your decision to give that news conference in July 2016 wrote that you were damaging the democracy, that the department is an institution, not a person. How do you respond to that? Those feelings have not gone away, in fact, they may have hardened since then. Yeah. And so I try to listen to it, because I could be wrong. I could be reasoning poorly, I could be seeing facts poorly and so I really try. And it's a balance, right? You don't want to listen to all criticism or you'll be overwhelmed and you'll be crushed like a grape. But you want to listen to people that you know to be thoughtful and experienced, and so I've tried to listen to it. I disagree with that, and I hope very much that those people read the book which is — wasn't the purpose I wrote the book, but in telling the stories to try and illustrate the challenges of trying to make decisions in a good way, I'm able for the first time to tell the full story about why I made the decisions I did. And I think if they look at it in an open-minded way, they may come away with a different view. Johnson: The other thing I'm hearing from inside and outside the Justice Department now is that Jim Comey was a pretty darn good prosecutor in his day. If he were a prosecutor now, and one of the people he was likely to use as a witness was out writing books and on a media tour, that would raise a lot of questions about inconsistencies and challenges to the case itself. Why are you talking now? I think that's reasonable. And what I'd say in response is normally, you don't want your witnesses out talking if they're going to have to testify later, and I don't know whether I'll have to testify later — but if I did the advantage in my circumstance is that my testimony is locked down. I testified in front of Congress extensively. I wrote memos, I wrote written testimony, and so long as I continue to tell the truth and don't start making stuff up that's inconsistent with that testimony, I don't see an issue. Again, I don't know whether there's going to be a future proceeding or I'll be needed. But if there is, I think the prosecutors will be OK with me. Inskeep: Let me circle back to the Hillary Clinton case and the decisions that you made there. You mentioned it was a no-win situation. What would you say was your greatest concern when it became clear to you that that email case was going to at some point come down to a decision by you? My greatest concern towards the end of that email investigation — it lasted about a year — towards the end was how does the Department of Justice, which includes the FBI, credibly close this investigation without charges and maximize public confidence that it was done in a just way. If it ends without charges. Because by the spring, if it continued on the same course and speed it was on, it looked to me like it was going to end without charges. And the credibility of the institution is important even in ordinary times. But all the more so when you're investigating one of the two candidates for president of the United States. How are you able to maintain public confidence that you're not a partisan, it's not the Obama Justice Department trying to give a break to Hillary Clinton. Inskeep: That's your concern. And so that I guess was behind your decision to make a public statement about the case. Just so the people understand, how would you have closed that case in the ordinary way? Suppose it was an ordinary investigation, you weren't concerned about perceptions of the FBI or the Justice Department, what would the FBI normally have done at the end of this case? In the ordinary case, we would most likely in writing prepare some sort of summary of what our investigation had determined and then send it over to the Justice Department, and they would in the ordinary case either say nothing, which is the most common case, or at most issue a letter to the target saying, or the subject saying it's over, or some minimal statement about it. Inskeep: So you decided to take another path, and decided independently of the attorney general to take another path, to speak in public about it. That's right. By the end of — by the beginning of July I made a decision that to protect the institutions — both the justice institutions, both the Justice Department and the FBI — the least bad alternative was to announce — the attorney general having said she would accept my recommendation rather than recuse herself — announce that recommendation and show transparency to the American people, to try to show them this was done in an independent, honest and competent way, rather than just do it in the normal fashion and just send it over to Justice. Inskeep: Here's the thing that's on my mind, director. You were hoping to demonstrate that the FBI was above political influence. Did you, in your course of action actually allow yourself to be politically influenced? Because you write first that you were concerned about criticism — essentially conspiracy theorizing — about the FBI, from Republicans that President Obama's candidate for president would be cut a break. Later on you talk about this meeting between the Attorney General Loretta Lynch and former President Clinton. And you say you had no thought that there was any conspiracy there, but after it became a big thing on cable TV, it changed your mind. Were you actually being influenced by cable TV pundits in what you decided to do? Yeah, that's a reasonable question, Steve. I don't think so, and here's why I say that: Even if cable TV punditry had never been born and there were no such thing, there would be intense public interest in a criminal investigation of one of the two candidates for president of the United States. So even if there weren't wings in our politics, which there always have been, but even if there wasn't that punditry, I think it would be an intense interest in knowing that this had been done in an honest, competent, independent way. And a number of things that occurred in the lead-up to that first week in July that led me to conclude, and reasonable people can disagree about this, but led me conclude that the best way to foster that confidence of an intensely interested public was to show transparency and do it separate from the attorney general. Inskeep: Was to not do what the ordinary course of action would be, and not do what your boss wanted? Correct. And what I would say is there wasn't anything ordinary at all about this. The FBI is criminally investigating one of the two candidates for president of the United States in the middle of an election year. I don't think it's ever happened, I pray it never happens again. But anyhow, I saw this as a 500-year flood. And so where's the manual? What do I do? So what I did was looked at the values we're trying to serve — public confidence in the work — and say the best way to protect that, given this unusual collection of circumstances, is to make that announcement, that transparency separately. Inskeep: But this is, and Carrie will have a question here in a moment I believe, but this is a thing that has on my mind based on what you write. You write that you thought it was ridiculous, that's your word, that Bill Clinton would walk across an airplane tarmac to say hi to Loretta Lynch in order to influence the investigation in some way — but that you changed your view after cable TV pundits made a big deal out of it and that that was part of your thinking. Would it perhaps have been a better course of action to resist all that shouting out there and do something closer to what you would normally do? Look, I meant what I said earlier — a reasonable person might have done that. I think that would have been a mistake, because again it wasn't just what had happened that last week of June, it was a collection of things that led me to conclude that the general public would have serious doubts about the integrity of the Obama administration's decision to close an investigation of Hillary Clinton without transparency, given those things that had happened. Johnson: With respect sir, was that your job? Was it your job to worry about those things? Oh, I think so. As the director of the FBI I think my job is to worry about how — despite what your mother told you about not caring what other people think — as the director of the FBI, the public trust is all you have in that institution. And so yes, worrying about that had to be part of the job description of the Department of Justice — I mean, of the leader of the FBI. And a fair criticism is, "so why were you worried about the Department of Justice?" Because we're part of the Department of Justice. And I see that as the institutions of justice, so I do — I probably wouldn't have answered this way, being able to see the future five years ago, but yeah, I do think it was part of my job. Johnson: Well, some people are arguing now that your decision to speak three times last year has produced a situation in which not just the president of the United States but a lot of other people in the country have a lack of confidence in the FBI and the Justice Department, and that it contributed to the sense of politicization and name calling that we're undergoing right now as a country. And I get that. Look, part of the problem is you can't go back and live imaginary lives. I believe, even in hindsight, as painful as this has been even in hindsight, the course we chose was the one best calculated to protect the institutions and the values they stood for. But maybe that's wrong. You can't go back and relive it. I think the institutions would have been in worse shape had we done the normal thing as Steve was asking in July, and certainly if I had chosen not to speak in October. Inskeep: Let me ask about another factor in your thinking as you describe it. You write in the book that there was classified information that you received about your boss, the attorney general, that made you concerned about involving her in your decisions. That that was a factor. You haven't said what the information is. The Washington Post has reported that there was an email connected to Russia somehow about Attorney General Lynch that is believed to be fictitious. And I think you said you investigated and didn't find anything there. But it was a factor in your thinking at the time. Looking back, do you feel that you were played by the Russians there? No. I know that I was not. I can't say more than that. The material that I was concerned about was genuine. But I have no reason to believe the content of it was true. That is, I have no reason to believe — I don't believe that Loretta Lynch did anything improper. My concern was the material will be released that would allow people to reasonably argue that she was compromised. Another brick in the load of my concern about the ability of the department to credibly close that investigation with the confidence of the American people. Inskeep: Your concern was that even if this email was fake it would go out into the public somehow. This information would go out into the public and affect the public's view of the FBI. Yeah — my challenge is I'm leaning as far forward as I can, given the FBI reviewed my book, and I've said as much as I can say. Inskeep: Let's go back and say that classified information, rather than email — you were concerned that even if that classified information was disproven, that it could somehow be leaked and that it would be damaging to the FBI. Yes, that it would allow people to reasonably question whether the investigation was being conducted in a competent, honest and independent way. And that's the challenge again. Just one more brick in the load of the things that led me to believe, "You know, I have to do something unusual here." It's the least bad alternative is to do something separate on July the 5th. Johnson: You memorably lampooned and befriended and spent a great deal of time with David Margolis, a famous Justice Department institution in and of itself, also called the Yoda of the Justice Department. He sadly died in 2016. Before his death, did you seek his counsel on any of these things? Did you seek his counsel before you decided to speak for the Justice Department? What did he tell you, if anything? I'm trying to remember what David's health was come July. I don't remember talking to him about — I have to be careful here. I remember talking to him or having my folks talk to him about certain aspects of this. I did not talk to David about the decision to make the announcement in July. Johnson: What do you think he would have told you? "You're totally screwed, brother." I think that's what he would have said. Inskeep: Why don't you explain who Margolis was. Margolis was the senior career official at the Department of Justice. A lifelong curmudgeon and source of wisdom, who had been on my staff when I was the deputy attorney general, and was the person people went to with hard decisions, to ask them for guidance. And I think he would have said, "You're screwed no matter what you do. In both of these instances you're going to be criticized." And I think he would have heard me out, my thinking. And honestly — it's easy to say because he's not here — but I honestly think he would have said "I think you have reasonable arguments to do what you're doing." Even if he did — he might have said yeah you should do that. But at a minimum he would have said "I get it. I get what you're doing. You're going to the daylights beat out of you." Johnson: You say in this book that on a couple of occasions the Justice Department advised you it was a bad idea to do something, but didn't order you not to, and that you would have followed orders. What kind of confidence, if you were Loretta Lynch or Sally Yates, would you have that you would have followed orders given that you decided to go your own way so many times in 2016 and before? Well twice with the announcement on July the 5th. So it really only once. By the time they're thinking about it in October when I to offer them the opportunity to weigh in. And they decided not to, but not to tell me not to do it. And so I don't know that they look at it and say, "he has a track record of not obeying" — in fact, the one time I was given a direction in connection with this investigation, I obeyed it. I was told call it a "matter." Inskeep: Don't call it a "criminal investigation," call it a "matter." And I did. And I did because it didn't make sense to battle about that. But I think you could look at the track record and say "actually, the guy does what we tell him to do. Inskeep: So you've made it clear that one of your goals was to protect the integrity of the FBI and the Justice Department. Did you? I think so. Better than the alternative. Yes. It's worse. But again people can disagree about this. And people I respect will. But my judgment is it would be worse today had we not picked the least bad alternatives. Inskeep: You're saying it could have been worse, but that it's nevertheless gone down. I think the decisions that we had to make and lots of other follow-ons, sure, the Department of Justice's and the FBI's reputation has been hurt. It's under daily siege from the current president — so, sure. Inskeep: Can I ask you to parse something that might be really difficult to think about — but you think really, really hard about your decisions so you may have given it some consideration. In addition to your concern about the institution, how much in these decisions were you concerned about your own personal reputation for integrity? That's a great question as well. I've thought about that a ton because one of the questions I would constantly ask myself is, "are you doing this because of you and not the organization?" And the answer is again, how well does do any of us know ourselves especially under pressure? I don't think so. In fact, I could see the future so, so could my wife, and I knew this was going to be very bad for me. This has been bad for me. My reputation has been hurt among people who are Justice Department veterans. And so the honest answer is I don't think so. And the only reason I hesitate is, who really knows themselves that well — but certainly not consciously, and I remember asking the question. Inskeep: But there is that alternative which prosecutors would ordinarily take, of "I'm just going to silently take whatever criticism there is, and people are going to think whatever they think of me and I'm just going to do my job." Oh sure. But you would then, I assume embedded in your question, is "I will not do the thing that I think is best calculated to protect the institution." I think that would be an act of selfishness. To say, "I'm just going to do my job and I'll be silent." Had I been silent, or had I decided in late October I'm not going to speak, I believe I would have done grievous damage to the — would have been better for me personally — probably would have done grievous damage to the institutions. Inskeep: Let me ask a question that plenty of people have posed since 2016, just to hear your answer to it. What is the difference between Clinton email revelations in October just before the election, which you talked about, and the Trump and Russia investigation of the same period, which you chose not to talk about in any way before the election? It's a great question and a totally reasonable question. And the answer is complicated but I'll try and be as tight as I can about it. The policy with respect to investigations is, we don't comment about pending investigations. We don't even confirm their existence unless there is an overriding public interest, and there will not be jeopardy to our investigation from abiding that public interest and making a comment. And so I think the Russia counterintelligence investigations and the Clinton investigation illustrate the rule, believe it or not. The Clinton investigation began in the summer of 2015 with a public referral to the FBI. Right. There was a public announcement by the inspector general, "I'm giving this to the FBI." Still, we refused to confirm its existence until October the 1st. And we confirmed its existence on October the 1st because there was a great public clamor — including in Congress — to know that the FBI was doing something, and the whole world already knew that we were doing something. And Secretary Clinton was the subject of that investigation, and nothing would be jeopardized by revealing that. That investigation was then announced as closed and completed, by me and by the attorney general, in July of the next year. The Russia investigation — there's two different investigations, there's the intelligence community's effort to understand, in the middle of 2016, what are Russians up to, and how are they trying to mess with our elections? Then there's a separate investigation, begun by the FBI in late July, that's a counterintelligence investigation focused on a small group of Americans, trying to figure out, are they helping the Russians in any way? And one of those Americans was not Donald Trump. He was not the subject of an investigation. And so in late July, we'd just opened that investigation. We were not in a position to say anything about that investigation for many, many months, for two reasons: We didn't know what we had. When people say, "you should have said more about the counterintelligence investigations, what exactly would we say? And second, we did not want to tip off these Americans that we might be onto something, trying to figure out whether they were connected to the Russians. You're going to interrupt, Steve Inskeep. Inskeep: I'm about to interrupt, I suppose, on two counts, one of them being that when it came to Hillary Clinton's emails, the discovery of more emails, possibly, on Anthony Weiner's computer, which led to the public statement there, you also didn't know what you had. Inskeep: And on the counterintelligence side, there was a public statement about that, and so that was in the public eye, and still you didn't talk about it. Inskeep: OK, let's talk about, so, but anyway, you didn't know what you had, but made a statement. But on the other case, you didn't know what you had, and didn't make a statement. Sure, I've lost my "didn'ts." Inskeep: I've lost it too. That's OK. But I think I can answer it. There was great discussion — there was never any serious given consideration by anyone to saying something about the counterintelligence investigations of Americans, not Donald Trump, that started in late July. There was lots of discussion of whether to say something, and what to say, about the broader intelligence community look at what the Russians are doing to mess with our elections. And that debate continued throughout the summer. In August I offered to speak about it, and to tell the American people, "here's what the Russians are up to." Not to talk about the Americans we were trying to figure out whether they were connected to, but the broader Russian assault on our election. And the administration didn't make a decision, didn't make a decision, and then finally in October, decided that they would make a statement about that. Hillary Clinton's emails. Inskeep: You didn't know what you had. That part, yet. I didn't know what I had, except I did know this from the investigative team. It's October the 28th. There are hundreds of thousands of Hillary Clinton's emails on Anthony Weiner's laptop, for reasons I couldn't imagine at the time. And not just that, there are thousands of emails from her blackberry.net email domain, which was the domain she used at the beginning, first three months as Secretary of State. We never found any of those emails, and you'll remember, a central issue in the case was intent. I saw no evidence of criminal intent, no intention, no knowledge of wrongdoing, but if it existed, it would likely exist at the beginning, when she started the conduct. And so, we're standing there about to get a search warrant, which the Justice Department agreed we needed to get, for hundreds of thousands of emails, including emails that may change the case. You have announced publicly — and whether or not I had a press conference, this would have been done — you have told the American people you are done in the summer of 2016. That is not true anymore. And so what are your options? Our tradition, our norm — and I keep hearing people talk about our rules, there are no rules on this, but there's an important norm. We take no action if we can avoid it in the run-up to an election if it might have an impact. I've lived that way my entire Justice Department career. So where's the door labeled "no action?" As I saw it — and again, people can disagree — but as I saw it, there were two doors, and they were both actions. Do I speak about this, or do I conceal it? If I speak about it, it'll be really bad. It could have an impact on the election. What's that other option? Conceal it. In my view, it would be catastrophic. That the FBI restarted an investigation that the FBI director and the attorney general told the American people was done and done well, "you can move on, American people, there's no there there," and that's not true anymore, and we don't tell anybody. So which do you choose? And reasonable people can disagree with me about this, but I actually don't think that's that close a call, at least, it wasn't to me. You have to speak. You can't choose the catastrophic option. And so — I'm sorry to run on so long, Steve, but that's how those fit together, and it is a circumstance I never would have imagined. Anthony Weiner's laptop brings back the Clinton case, after we've told the American people it's over? That was a no-win situation where we chose the least bad option. Johnson: If the polls had been closer, or if the people in Maryland, D.C. and Virginia that you came across every day in the newspapers you read and the television reports you saw had characterized the presidential race as much tighter, would you have made a different decision? I don't think so. I don't think so. Because I don't remember consciously thinking about, this is a decision we have to make because of where the polls sit. I don't. In fact, I tried very hard to push away the impact it might have on either of the candidates, because I didn't think that was legitimate for us. But what I've said in the book, which has been much misunderstood, is I'm trying to be introspective and cross-examine myself, because I'm looking back and saying, "you were sitting in an environment where all the polls showed that Hillary Clinton was going to win, could that have influenced you?" And my answer is, of course it could have. But I don't think it would have changed the decision. Catastrophic, conceal, really bad, speak; would have been the case regardless of what the polls say. You could make an argument, I suppose, that if Donald Trump had been up by 30 points, the catastrophic would have been way less. I still think it would have outweighed — the badness in that would have outweighed the badness in the speak option, but the answer is, I don't know for sure, I don't remember thinking about that, and I think I would have made the same decision either way. Johnson: You've written that your wife and your daughters were Hillary Clinton supporters, and in fact, some of them marched the day after the inauguration. What was election night like in your house as the polls came in, as the votes came in and Donald Trump appeared to be the winner of the election? I don't think we talked about it, because my wife knew that I was trying to push away politics. If you were to interview her, and maybe you will at some point, she would say it was kind of bizarre that her husband was trying not to follow the political race. Inskeep: You didn't have the television on, the radio? I think the television was on. I actually think my family was in Connecticut, and I was in my bachelor house in Northern Virginia, so we must have had some communication. But we didn't talk about it a lot, because I knew how passionate she was about wanting the first female president, wanting it to be Hillary Clinton, and so there was nothing good for our marriage in talking about the decisions I'd had to make. Johnson: Yeah, but that was the biggest political upset in modern history, how could you not have talked about that? I'm sure I talked about it. I don't remember talking about it with my wife that night; I'm sure we talked about it at some point, probably that night. But anyway, I remember watching TV, I just don't remember, as I sit here, talking to my wife about it — that could be because she was on the phone in Connecticut, not taking my calls. I was surprised that Donald Trump was elected president. I hope not. And I still feel that way. I read people arguing that we did, and I sure hope not. It doesn't change how I think about the decision, but it makes it all the more painful. I once said, testifying, that it made me mildly nauseous — to which my daughter said, it should have been "mildly nauseated" — but it makes me sick to my stomach to think that the institution I led and loved, because it has no involvement in politics, might have made a difference. To my mind, it illustrates the no-win nature of the situation, because it wouldn't change my view of the decision. Inskeep: Mr. Comey, you write about the way that you ran the various offices that you supervised, that you encouraged people around you to speak truth to power, so to speak. And you write, "speaking uphill takes courage." Speaking to your boss some uncomfortable truth takes courage. Do you feel that you always spoke uphill in the right way to the new president, once he took office? Inskeep: "Honest loyalty" was what you said you would give the president when he asked for loyalty. Yeah. That one I'm not so tough on myself, because his first request for loyalty stunned me, and so all I thought to do was just not move, not even blink, and then by the time he brought it back in the dinner, I'd already given him a couple of interjected little speeches about the independence of the Justice Department and the FBI, and the importance of that distance, and so by the time we had this awkward exchange where he said again he needs loyalty, and I said "you'll always get honesty," and he said, "honest loyalty?" And I made that, sort of to get out of the conversation, said "that's what you'll have from me." I think he fairly understood what I meant, because I'd given him those little lectures in between. Johnson: You know, you write in this book that you have little confidence in the current Attorney General Jeff Sessions, who's overmatched for the job in your view, and you have some very harsh words for the Deputy Attorney General Rod Rosenstein, and that extends in some part to the Russia probe. Is it time for a change in leadership over there? I can't speak to the A.G. because I worked with him. I mean, that was my impression — I'm trying to be honest in the book — that was my impression of him in the, I forget what it was, three weeks, four weeks we worked together. With respect to the deputy attorney general, I think it's very important that he stay, because I do think he has conducted himself honorably with respect to his appointment of a special counsel and his assertion of the importance of that special counsel's work to the rule of law. And so I really do think it would be an attack on the rule of law for him to be fired, or for the special counsel to be fired. Johnson: Speaking of the special counsel, he had a couple of jobs --or at least one job — that you had. In these moments you write about so vividly in the book, the hospital bed standoff in 2004, the fight over enhanced interrogation, harsh interrogation of detainees, torture, Robert Mueller made different decisions than you did often. He decided not to speak. Or when he spoke, to not say as much as you did publicly. And I wonder how you think about that now, given that in those situations he was the FBI director. You were at the Justice Department. You made a different choice when you were at the FBI and somebody else was at the Justice Department. Yeah, that's right, although the situations are very different. The two you're talking about from 2004 and 2005 didn't involve any public speaking at all by anybody. There were struggles within the government. And Bob Mueller was involved in one of them, and met alone with the president and told him he was going to quit. And so I think he spoke very strongly. But all of that was secret. But look, as I try to make clear in the book, reasonable people — including Bob Mueller — might have made different decisions in 2016 about speaking. Different decisions than I, and still made them in a responsible way. Johnson: He still doesn't speak about that stuff, though. You testified on Capitol Hill about it. You've done interviews about it. He still refuses to answer questions about those episodes. Oh, OK, I didn't know that. Is that right? I know his notes from that time, he took extensive personal notes in connection with the hospital incident and the NSA surveillance program which were made public. But I take you at your word. Inskeep: Mr. Comey, I want to ask a little more about some of your meetings with President Trump. After you were fired, of course you testified before Congress about them, and some of the commentary about your testimony said, "Comey has just laid out the case for obstruction of justice. He's put out all of the evidence and the predicates for obstruction of justice." In your book, you describe the meetings again — but then offer your own judgment, which is that this may not amount to obstruction of justice. Why did you go there? Because I don't know the answer. And I don't think — I hope I didn't testify publicly that it was obstruction of justice. Inskeep: If you were the special counsel, or if you were just a prosecutor as you once were, would it complicate your job if a very prominent, very knowledgeable witness said, "having experienced these events, I'm not sure they are obstruction of justice?" Not necessarily, if he said it. And I think I've said it here, and said it very carefully in the book: I'm not saying it's not. I'm just saying I'm a witness, and I see this conduct, it could be obstruction of justice, but I don't know and can't say without a full piece of the picture. So I think my reaction as a prosecutor would be, "that's fine." I wouldn't expect — in fact it will be worse if my witnesses are out there saying "I think" and thinking beyond what their factual experiences. Inskeep: You think you've done better by kind of allowing for both possibilities. Well I think I've been truthful and not tried to overreach. I think it would be an overreach for someone on my part to say, "I know what the evidence is." How would I possibly know what the evidence is? I don't know what communications President Trump's staff were having with him. I don't know what he said to others. I have no visibility into that. So it would be irresponsible to say that. But I also don't want to be a weasel and say, "I don't see any evidence of obstruction of justice," because I do. That conversation is potential evidence. Johnson: Director Comey, can a sitting president be indicted by the Justice Department or a special counsel? I don't know the answer to that. My understanding — and this is just from reading blogs and articles in the media — is that there's an Office of Legal Counsel opinion that's currently alive and well that says that a sitting president can't be. But I don't know enough to give you a view on whether that's a good opinion or not. Inskeep: A couple of other things to ask about, Director Comey. One has been in the news, your former deputy Andrew McCabe, as you know, was fired after an inspector general report found that he authorized communications with a Wall Street Journal reporter in a way that he shouldn't have. McCabe said you gave him permission to do that. Did you? No. I don't think McCabe even says that. I think what McCabe says, because I've read the report, is that he thinks he told me he had done it after he had done it. Inskeep: You have no recollection even of that. No. And I'm quite confident that didn't happen, as is the inspector general. Inskeep: Is it appropriate then that he was fired? That's a judgment I can't make. What is appropriate is that the inspector general did the kind of investigation that that organization did. This is what an organization, an institution committed to the truth, looks like. This is what accountability looks like. There is indications that someone made a false statement. It's pursued, it's investigated and if the inspector general concludes the evidence is sufficient and the leadership does, that person is held accountable. That's what it looks like. The problem with this whole situation is the president's stained those institutions, the entire Department of Justice and the inspector general, by doing something wildly inappropriate, which is calling for Andy McCabe's head. What that did was — and it might be that the president can't imagine an institution that holds people accountable like this — that called into question the entire process. So even if the process was sound, and I've no doubt it was sound given the nature of the people involved in the inspector general's office, there's corrosive doubt about whether it's a political fix to get Andy McCabe somehow. And that's a wound that was inflicted by the president's actions on the Department of Justice. Johnson: I've got a question for you. Oh the last few days of your book tour, some people have argued that you've been stained by your interactions with the president. They don't understand why you engaged in some name-calling of the president and making fun of his appearance and the like in your book, and to them that makes some of the more high-minded points you are trying to convey in the book less powerful. Yeah, they should read the book. Because I'm not making fun of the president. I'm trying to be an author, which I've never been before in my life. But while I'm typing, I can hear my editor's voice ringing in my head, "bring the reader with you. Show them inside your head. Bring them with you." Inskeep: "Describe the president's hands." Can you hear the editor saying that? No, but that was on my mind. And by the way, not that this matters, but I found his hands to be above average in size, and so I'm not making fun of the man, I'm trying to tell the reader what's in my head. And the reason I say I read the whole book is, I hope you will see that richness of detail when I talk about the hospital scene, when I talk about terrible tragedy when my wife and I lost our son Collin. When I talk about President Obama, I talk about how skinny he struck me, as — I'm not trying to make fun of President Obama. I'm trying to show the reader this is how I was experiencing the world, and bring them into those rooms with me. And so I really do think the folks who are picking up on that, it's just a sign to me they haven't read the book. Inskeep: If you were still overseeing the investigation of the president or the people around the president or however we should currently phrase it, what questions would be on your mind? I don't think that I can answer that, because I've been careful in my book not to reveal any details from the investigation. And so I don't want to start framing questions without thinking about it very carefully, Steve. Inskeep: I can give you a moment, it's fine. Yeah, I bet you can! Inskeep: No, seriously, I mean, you're out of it now. You've pointed out that you don't know all the evidence anymore. Maybe there never was a time that you knew all the evidence, because it wasn't your day to day job. What do you wonder about? Well the reason that's so hard is, I would just want to know, do I have quality people and am I aggressively pursuing all logical leads? And I don't have any idea what Bob Mueller's team has found in the last year, and so you need to know that to know what questions you would need to ask next, if that makes sense. And so it's very hard for me to answer in the abstract. Johnson: Some of those members of the team have been getting a bad rap from the president and his allies for almost a year. You've worked with some of those people. What's your impression of their skill and their nonpartisan — or less so — behavior? Bob Mueller has put together an all-star team. An all-star team. And I've read stuff in the paper about some of them have contributed Democrats and some to Republicans, OK. Lots of people in the Department of Justice have political preferences and they even vote — which I didn't do — they even vote. But what they train themselves to do, and been trained to do is they check that at the door. And so I think the American people can have high confidence, if Bob Mueller's team is allowed to do its work, they will find the truth. I don't know what the truth will be. I don't actually care what the truth is, so long as they find it and they're allowed to find it. And he has the talent and the drive to do that. Because I'm very worried. And one of the ways I hope to be useful is having people realize that there's something above our normal fights. We fight like crazy in this country about guns and about social issues and taxes and immigration, and that's as it should be, and it's always been that way. But there's something we all have in common, which is a core set of values that is us as America. Like freedom of expression, freedom of religion, rule of law, equal protection of the laws, the truth. We hold these truths to be self-evident. It's the fourth word of that sentence. So there's a thing, a set of values, that's above our normal fights. And what I'm worried about with this president is, he threatens those. And if we lose those, if those norms are degraded, those values are degraded, what are we exactly? And so I'm hoping that I can be useful in saying to people, it doesn't matter whether the Republican or Democrat or neither. We need to think and talk about those values. And there's a danger. President Trump, I don't follow him on Twitter but I get to see his tweets tweeted, I don't know how many, but some tweets this past couple of days that I should be in jail. The president of the United States just said that a private citizen should be jailed. And I think the reaction of most of us was, "meh, that's another one of those things." This is not normal. This is not OK. There's a danger that we will become numb to it, and we will stop noticing the threats to our norms. The threats to the rule of law and the threats most of all to the truth. And so the reason I'm talking in terms of morality is, those are the things that matter most to this country. And there's a great danger we'll be numbed into forgetting that, and then only a fool would be consoled by some policy victory. Inskeep: Can you state it even more plainly, because there are many people on the other side of the divide here. What's wrong with the president saying you should be in jail? The rule of law involves the apolitical administration of justice. This is not some tin pot dictatorship where the leader of the country gets to say "the people I don't like go to jail." Our Lady Justice wears a blindfold. And the reason all those statues all over the country have a blindfold is, that's the way it has to be. Lady Justice can't be peeking under the blindfold to see if Donald Trump wants her to convict so-and-so and not convict so-and-so. If we lose that, we've lost the rule of law, and so there's great danger in the president of the United States saying "you should be in jail." Inskeep: And speak, if you could, to people on the other side of the divide here. You write in the book, of the president of the United States, "I see no evidence that a lie ever caused Trump pain, or that he ever recoiled from causing another person pain." As a general rule, that sounds pretty awful. And yet in interviewing voters over the past few years it's clear to me that some people look at those qualities and see strength. They want someone who is ruthless. They want someone who is tough. They feel he's on their side. What do you say to people who feel that way about the very same qualities you criticize? I would ask them to reflect on what it is their fathers and grandfathers and great-grandfathers fought and died for. So many people who passionately support Donald Trump have proud and wonderful histories of service in their families. What did they fight and die for? Did they fight and die for an immigration policy? Did they fight and die for a ruthlessness in our leaders? No, they fought and died for that core set of values. They fought and died for equal protection of the laws. Justice. The truth. They fought and died for a collection of ideas that is all we have. And so I'd ask them — I get why people are frustrated in all different parts of the country, but we have to step back and say, "so what is it we are as a country?" And we are a set of ideas. We are a set of aspirations. We can't lose those. We can't sacrifice those because we're angry about other things. And so I'd ask them to say, "look I know you're fired up. Think about your grandfather. Think about your great grandfather. So what was it they were risking their lives or losing their lives for?" Johnson: Couple of things. Kellyanne Conway, presidential counselor to Donald Trump, was on television today saying you seemed to be perfectly happy to go to the White House a number of times after the election, because you appear to like it there and like the shrimp scampi dinner, and it's only after the fact that you raise questions about independence and the president's alleged misbehavior and leaning on you to close investigations — how do you respond to that? You really need to respond to that? That doesn't make any sense to me. Inskeep: How is the dinner? How is the shrimp scampi? It was OK. I'm used to having something else on the shrimp scampi — it was just shrimp and nothing else. Johnson: Last year, when you emerged publicly on Twitter, there was a photo of you in running shoes. On a road in Iowa. Which led a lot of people to think — as some of your friends have long thought — that a political race was in your future. What's next for you there? Never. I will never run for office. Not even a close call. What's next for me is, I've signed up to teach. I taught this year at Howard University. I'm going to teach next year at my alma mater William and Mary. I'm going to teach about leadership and ethics, and so I'm going to be a professor, which is exciting, and speak about leadership. Travel around and speak about it. And I think by doing those things I can be useful. I'm going to use my book in the class and I'm going to buy it for the students, because I'm not going to be one of those professors. Inskeep: That makes people buy their books. Yeah, heck yeah. I've always hated that. Inskeep: Has this experience cost you a lot of friends? Not a lot of close friends. I don't have a lot of close friends, but not them. I think it has caused some estrangement with people who were kind of in an outer circle of friends, who have decided they know my heart and my head in ways they can't possibly. And so it's not in the — I hate to put my friends in circles — but not in the close friends that I see all the time and know and love well. But some in the outer circles. Inskeep: Two or three circles out there might be some. I don't know that I have three circles but OK.
Inskeep: I was thinking like, Dante or something. People on the right as well as the left you've lost. Yeah I think that's right. Yeah, I think people's disdain for me is in a way bipartisan, which I never imagined I could achieve. I knew I was going to anger at least one part of the political spectrum with whatever decision we made in the Hillary Clinton email case. I managed to piss off partisans on both sides. That's OK. That's OK. I can't do anything about that. Johnson: Director Comey, did you move up the publication date of your book to get out in front of this massive inspector general report we're waiting to see, about the Justice Department and the FBI's handling of the 2016 investigations? No. No way. I thought it be out already. My publisher moved up the publication of the book because they thought people would be interested in it. Johnson: Are you concerned at all about what's going to be in that IG report for you and others? Not concerned. I'm interested. I encouraged that and pushed for that investigation, and cooperated even after I left government, and maybe they'll criticize me. That's OK. What I wanted was a full accounting of the decisions we made, the policies at issue and all the rest of it, so that it was looked at by someone other than me or people with an ax to grind. Inskeep: This is maybe my final question unless you have anything else, Carrie, and we can let this gentleman go. You have recounted for us a series of decisions that you made in which you often felt you had to pick the best of bad options, but you still feel it was the best option. Looking back, is there any significant choice that you've made over the last couple of years that you regret? Oh sure, yeah. Maybe not as significant as these, but I did a number of things that were mistakes in my view. Carrie Johnson may remember one — I carelessly said things in a speech I gave about the Holocaust that caused a major row with the Polish government, and I should have been more deliberate and thoughtful there. I think I entered the debate about encryption in a thoughtless way. I acted impulsively and commented at a brown bag lunch about how bugged I was by an Apple advertisement, and that was kind of stupid. I should have entered in a more thoughtful way. If you give me more time I'm sure I can come up with others. But yeah, I am a person, I make mistakes all the time, which is why I worked hard to surround myself with people at the Department and the FBI who would bang on me, who would talk to me, who would tell me what they thought — speak uphill. And I think we did that when making the hardest decisions of all, when there was no good option. Inskeep: When you conclude you've made a mistake, do you have sleepless nights about it? Sometimes. But normally I just come clean with myself and those around me and say, "I totally screwed that up," and then I ask the whys. "So why did you do that? What was the reason for that?" Then once I've gone through that process, I sleep like a baby. It's where my sleep is disturbed is wrestling with things where I can't find a good option. And there's — I recount in the book, the torture struggle haunted me and I couldn't sleep. And once I make a decision, and if I've made it — and I always tried to — in a thoughtful way, even if I've made a decision I made a mistake, I'm OK. I'm sleeping well. Inskeep: Was there any decision relating to Hillary Clinton or Donald Trump that cost you a night of sleep before or after? Well as I said, I woke up in the middle of the night after Donald Trump tweeted at me about tapes. I didn't sleep much that night thinking through what should I do. Inskeep: You ended up tweeting back at him, as I recall. No, I ended up asking a friend of mine who was also my lawyer to put out an unclassified memo content about our February 14th encounter in the Oval Office. But I'm sure — I don't remember sitting here waking up in the middle of the night other than that time. I was working very hard during that time, and trying to make sure I got sleep and exercise, though, because when you're tired and you're sluggy, you're not going to make sound decisions. But sitting here, Steve, I can't remember a particular night otherwise. Johnson: You spent most of your life in the Justice Department or the FBI. What are your concerns for those institutions now? And do they have the strength to withstand the stress that they're under? The institutions have the strength because it's the people. And the people are incredible ballast for those institutions. They're committed, they're apolitical, all the things you'd want them to be. My worry is, I said earlier in response to one of Steve's questions, that you're in the public trust business when you're the FBI, the Department of Justice. When you rise in a courtroom, people can't see you as a Republican or Democrat, they have to see you as the good people just trying to figure out what's true. These attacks, especially now, coming from this administration, risk undermining that, so that the FBI — which is not politicized internally — becomes politically attacked and doubt creeps in in those courtrooms and on those doorsteps on the street corners. We will all be sorry if that happens. Inskeep: Director Comey, thanks very much. Inskeep: This is great. Appreciate it. Did we miss anything important that you wanted to talk about, or get anything wildly wrong other than whatever you may have already disputed? No, I don't think so, and I think your questions — one of the things I've been worried about with my work this week is that people think it's a book about Donald Trump, and it's not. It's a book about ethical leadership. I tried to tell stories to interest people, but I hope without even knowing it they're learning things about making hard decisions. But I couldn't write about ethical leadership without including those stories about Donald Trump. But I hope that people will find useful the entire thing. And I suppose after initial period of focus on President Trump, maybe we can get people to think about it in the way you did, right? The hospital story. Torture. Barack Obama. George Bush, all those things. I think those stories will be useful to people. Johnson: The Washington Post had kind of a tough book review on you, examining whether you stood up in your book to the principles you set out. And one of the things that's come out is that the former Attorney General Loretta Lynch said, "listen, he never spoke to me about some of these concerns." Did you live up to your principles in this book? I sure think so. I didn't read the Post review. I don't read reviews because I don't want to over index, fall in love with the positive or be very depressed by the negative. But I think so. And I don't hear Loretta Lynch, who I meant when I said I like and respect, I don't hear her to be saying anything different than that. And so I think so. I've tried in this book to be transparent, honest and complete and show people where I've fallen short, what I worry about with myself, and give them a window into how we made decisions. And I think if you read the whole book, I think fair minded people will come away — they may still think I'm an idiot, but I think they'll come away saying, "kind of a thoughtful idiot, and tried his best to make the least bad decision in all these circumstances."